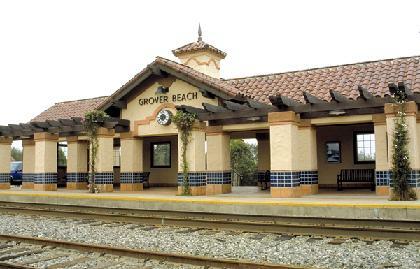 Grover Beach is the site of a Multimodal Transportation Facility, commonly referred to as "The Train Station". The Train Station is within a short walking distance of Pismo State Beach, the Beach Boardwalk where visitors enjoy spectacular views overlooking the dunes and Pacific Ocean, the Monarch Butterfly Grove, as well as many local restaurants, shops, and businesses. Location: At the corner of State Highway 1 (Pacific Coast Highway) and W. Grand Avenue in Grover Beach, CA. From Hwy 1: This is the west side of the facility and serves as the primary entrance for rail passengers. From W. Grand Ave: This is the north side of the facility and serves as the primary entrance for rail-bus service (motorcoach), as well as access to commercial, retail, and restaurant businesses located at 180 W. Grand Avenue, Grover Beach, CA. Construction is scheduled to begin in 2018 to expand the current Amtrak train station site to incorporate a bus passenger loading/unloading area and shelter along with adding additional parking spaces and improving landscaping and accessibility on the site. The Train Station Expansion Project is a grant-funded regional transportation project that will enhance safety and convenience for travelers. Amtrak Rail Service: Amtrak currently provides rail service with two daily stops of the "Pacific Surfliner" and two daily round trips of connecting buses (motorcoach) to destinations in the Central Valley (Hanford) and cities located in Southern California. Amtrak tickets may be purchased onboard the train, online at www.amtrak.com or by calling 1-800-USA-RAIL (1-800-872-7245). With a paid reservation and Amtrak reservation number(s), a MetroLink ticket voucher machine is available at the Grover Beach Train Station to pick up your ticket(s). Parking: There is free short-term parking in both parking lots that serve the multimodal facility. Payphones: A payphone is available at the Train Station.